…. or shop for it in your local Episcopalian bookstore. Click here for a store in Seattle. After retiring from a career as a “government bureaucrat” serving primarily in the criminal justice system, Kathie Deviny studied creative writing. Her essays have been published in the Seattle Times, Episcopal Life, Cure magazine, and Faith, Hope and Healing by Bernie Siegel. Kathie and her husband Paul divide their time between California and Western Washington. 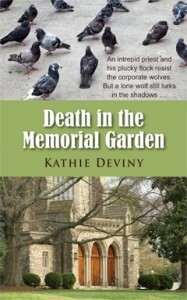 Death in the Memorial Garden is her first novel. Click here to find Kathie online. The obstacle, once unearthed, proved to be the size and shape of a wine crate. It was a wine crate, Robert Vickers realized. As a matter of fact, he told Raymond, the security officer, it was the same type of crate that held the sweet wine used by Grace Church for communion services. The top looked to have been removed and then crudely re-nailed. “Good job, Henry! Now go to the tool closet and bring back a crowbar,” he ordered. While they were waiting, the priest noticed that the number of food bank clients and other spectators had swelled and were spilling into the street. A man in a turban jostled against another sporting a suit and fedora. A woman wearing a long navy blue dress and veil was offering her potatoes to a Hawaiian-shirted fellow in exchange for his rice. The babble of many languages rose on the rainy breeze, lending the scene the air of a modern-day Pentecost. All that was missing was the dove, although there were plenty of pigeons underfoot, hoping for a handout. Robert was not surprised to see the tall figure of Clare, known to all as the Pigeon Lady, among the crowd, swathed head to foot in a hooded brown robe. Wherever she went, the pigeons followed, even though the Health Officer had persuaded her to stop feeding them. Robert also spotted Marjory, Clare’s caretaker, standing nearby and shaking her head as if to say, “What can I do?” Clare’s arms were outstretched, as if to bless them all, bird and human alike.